Tip #1 – First, decide if you want a band or a performance. 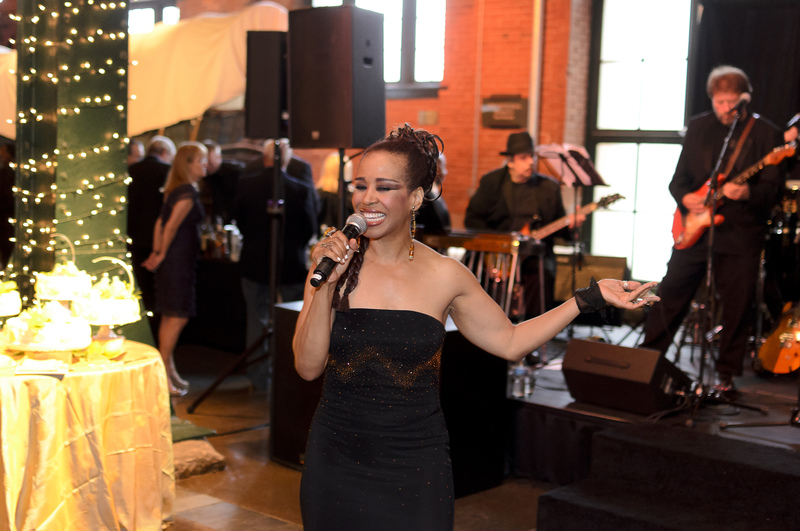 There are many different types of live music available, so consider if you want your band to play in the background, if you want them to get involved with your guests on the dance floor, or if you want the band to put on a “performance” for your guests. One way isn’t better than the other – it all depends on the type of event, your audience and the type of atmosphere you want to create. Keep in mind if you’d like the band to help run the evening’s events; the Band Leader can help you create a schedule that corresponds with the band’s schedule. If you have any special requests, such as a song you want to have played or a special type of music, make sure to ask your band about your request upfront. Also, make sure to confirm your choice with your venue, as some spaces are not idea for a band or performance. Tip #2 – Select a band or performer for your audience, not yourself. You and your significant other may be total hip-hop fans, but your wedding guests may not be ready for the club scene. 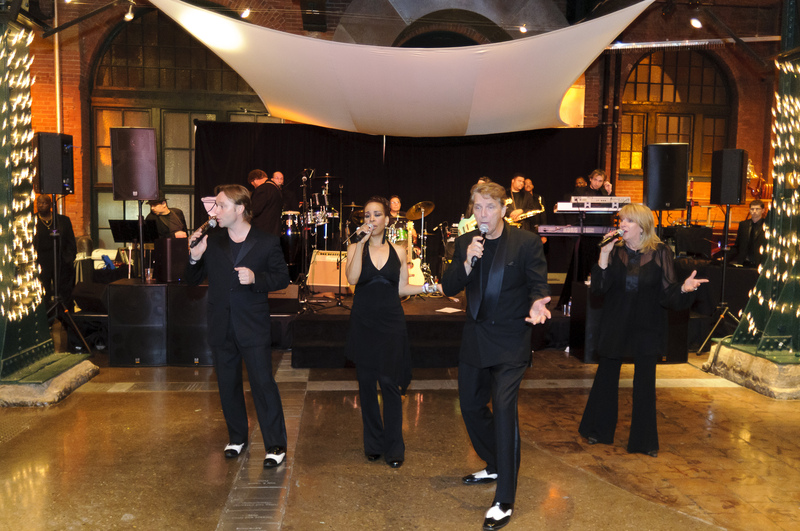 If you want guests to dance, hire a band that will keep people interested. Think about the characteristics of your crowd. You may love the sounds of Motown, but if the majority of your guests are recent college buddies, they might need to hear the newer hits to get their groove on. Tip #3 – Determine your budget. Fees can vary based on the size, quality and experience of the band, as well as how long they will be performing, if they have to travel to the venue and if they have to rent any extra equipment for the space. When it comes to professional musicians, they deserve to be paid what they are worth. If you want the best, you will have to pay for it. However, if you need to select a smaller or less experienced band because of budget, don’t sacrifice quality. No matter what band you select, ask for references and see what past clients have to say. Tip #4 – Visit a performance. A lot of bands have past performances and demos online and some will give you a CD to listen to, but nothing can take the place of seeing the band perform live. Ask the band if they’re playing a public show in the near future or if you can attend a practice. If you’re working with an agent or wedding planner, make sure you have a chance to meet the Band Leader who will be your on-site contact the day of your event. Tip #5 – Don’t wait to book! Bands are often hired 8-12 months in advance, so don’t hesitate to book the band when you find the one you like. With weekend weddings and events so popular, chances are there will be other brides or clients looking at your same date. In addition to a contract, most bands will require a deposit to hold the date. For help choosing a band for your wedding or event, email us at ashley@helloproductions.com. It is easy to feel sluggish about work when the weather is gorgeous and you would rather be outside, in the pool, on vacation, etc. Show your employees you appreciate them with a company picnic and use it as an opportunity to keep them motivated. Here are a few ideas to help you plan a company picnic! A team meeting (disguised as a picnic) can reenergize your employees as individuals and as a team. Here are a few things to add to your agenda. Make sure to properly invite your employees, with the location, date and time made very clear. It’s a lot harder to motivate your employees when they aren’t there. Serve lunch. It’s not easy to concentrate when you’re hungry, so start the meeting out with lunch. You can do traditional picnic foods or have it catered. 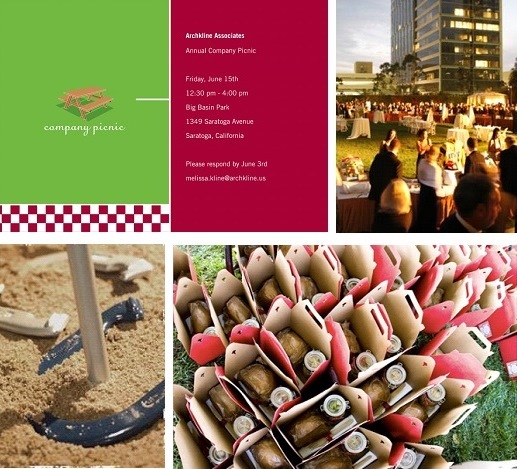 Clockwise from top left: Invitation (tinyprints.com), Outdoor Layout (helloproductions.com), Horseshoes, and Boxed Gourmet Lunch (www.elizabethannedesigns.com). Encourage the managers to attend and mingle with their departments, not just other managers. Have a problem getting different groups of employees to mingle? Number each picnic table and give each employee a number as they walk in, encouraging them to sit with different groups. Review the company goals for the recent quarters and note which ones have been met and which ones need improvement. Visual aids, such as an outdoor screen or poster board-sized charts, will help keep everyone’s attention. Recognize different employees for mid-year accomplishments. This can be goal-related or just above-and-beyond behavior, such as going out of their way to train a new employee. Have a question and answer time for all the employees to voice questions and concerns to the managers and/or CEO. End the day with something fun – such as team activities or friendly competitions. Need help with the details? Contact Hello Productions today! August and September are perfect months for cookouts and campfires. Why not impress your friends and family by adding some “glam” to your next get together. Glamping (or glamorous camping) is a form of camping involving more luxurious accommodations and accessories than traditional camping. We’ve taking the idea of glamping and put together some ideas for a glamorous cookout and campfire. Instead of camping chairs or wooden benches around a fire pit, bring out your kitchen or dining room chairs. Use colorful throw pillows (and blankets if it’s a chilly night) to make the seating as comfortable as possible. Forget tiki torches and traditional citronella candles. This evening calls for lanterns. If the bugs are out, use citronella votives inside your lanterns or decorative votive holders. Skip the paper plates and set your picnic table with real silverware and china. Don’t forget the cloth napkins! A cookout is a perfect way to feed your guests – you can even impress by looking for unique ham and hot dogs at your local supermarket (such as Cracked Pepper and Garlic Burgers or Al Fresco Chicken Sausage with Sundried Tomatoes). Everyone loves s’mores but not everyone loves the mess they make. We love these updated (and easy to eat!) s’mores! Click the picture for the recipe. If you decide to attempt s’mores the old fashioned way, these Anthropologie marshmallow roasting sticks make a great accessory! Click on the picture below for more details. Glam up your beverages by adding colorful fruits and herbs. You can also bring out a piece of indoor furniture outdoors for a glamorous beverage station. No camping or cookout party would be complete without star gazing once the sun sets. We found an easy-to-follow constellation guide for your guests. For more glamping ideas, follow Hello Productions on Pinterest!